Opening 19 stores in the US to mixed success and more to come, Microsoft is set to invade the UK and open its very first retail outlet in London in March of next year, The Verge reports. According to sources, Microsoft will first launch an online retail presence for UK consumers later this summer, waiting a number of months to opening a bricks and mortar store in London’s capital, with the view to open more in the country. 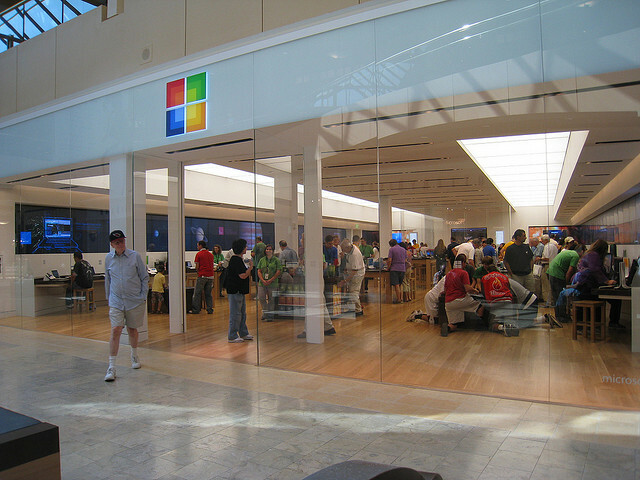 With the success of Apple’s online and retail stores across the world, Microsoft reevaluated its sales strategy and opened its first Microsoft Store in October 2009, choosing Scottsdale, Arizona as its first retail location. The stores are very Apple-like in their appearance (beech tables, large windowed frontages and “Technical Advisors” that are eerily similar to Apple’s Genius employees), offering Microsoft-certified PCs, Xbox consoles, peripherals and software. The stores are often located near stores operated by its Cupertino-based rival. This isn’t a coincidence; Microsoft wants it that way. First stores, now the company is producing its own tablets, named Surface, to compete with its more profitable rival. If we can expect Microsoft to open stores near Apple’s own in London, could we see the first store open in Covent Garden, Regent Street, in one of the Westfield Centres?